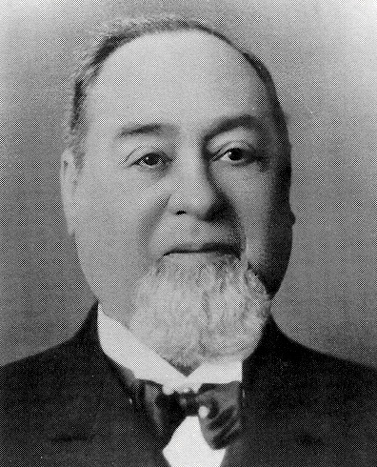 Levi Strauss, founder of the Levi's Company. The inventor of the "quintessential American garment" was born Loeb Strauss in Buttenheim, Bavaria 1829, the son of a dry goods peddler. By 1848 he had arrived in Kentucky and was learning dry goods trade. He arrived on the heels of the gold rush in 1853 to San Francisco. He opened his first store with his brother-in-law in a small building on California Street. By 1866 his headquarters took up both 14-16 Battery St. The man who insisted all his employees call him Levi was active in business and cultural life of San Francisco. He supported the Jewish Community and belonged to Temple Emanu-el. Like most Jews who arrived in San Francisco, Levi Strauss sought his fortune in commerce, not gold. Strauss, in business with his brothers in New York, exemplified the typical Jewish merchant dependent on credit and supply from friends and family based in the east coast. It is not known how he came up with idea of creating sturdy work pants from canvas but the pants quickly became popular as he took jeans on the road as peddler traveling throughout small gold country towns. One version of the jeans brainchild recalls Levi pushing a cart of denim for tents through the muddy San Francisco street. According to the story, a miner informed Levi that it was not tents, but sturdy pants that were in demand. In a flash, Levi brought the miner and a swath of denim to a local tailor and ... the rest is history. However, it was in 1872 that Levi received a letter which changed the company's history. Nevada tailor Jacob Davis started placing metal rivets at the points of strain on pants with cloth he bought from Levi Strauss and Co. He wrote Levi with the invention and suggested they patent the process together. The demand for these "waist overalls' became overwhelming. In 1890, the lot number 501 first appeared on the denim overalls, and Levi and his nephews incorporated the company. Levi was a charter member and treasurer of the San Francisco Board of trade since 1877. He contributed to Pacific Hebrew Orphan Asylum and Home, the Eureka Benevolent Society and the Hebrew Board of Relief. In 1897 he provided for 28 scholarships to UC-Berkeley.